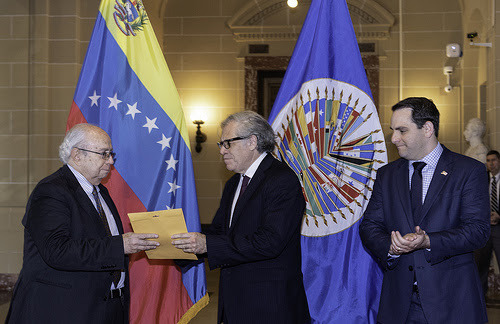 The new Permanent Representative of Venezuela to the Organization of American States (OAS), Gustavo Tarre, today presented his credentials to the Secretary General of the hemispheric institution, Luis Almagro. Secretary General Almagro welcomed Ambassador Tarre, "with whom we will work to deepen the path to democratization, peace and justice for Venezuela." He also recalled that, at the meeting of the OAS Permanent Council on April 9, "the voices in favor of democracy in the hemisphere" voted for the resolution that accepted his appointment. For his part, Ambassador Tarré highlighted the struggle of Secretary General Almagro for the freedom of his country, and the step taken by the Permanent Council in recognizing him in his post. "Yesterday the usurpation ended with regard to the chair of Venezuela, now we will work for a transition government and free elections," he added. Ambassador Tarre will represent his country "pending new elections and the appointment of a democratically elected government," according to the Permanent Council resolution.